...Hi, my name is Jennifer and I jump out of planes. When it comes down to it we probably did this for different reasons. Tobi did this for her dad, in honor of his life. I was moved by the adventures my uncle had in his life to live mine to the fullest. I don't know what I expected to feel, other than fear for my life, but now that I look back at it I remember my heart being full of peace as I fell through the blue blue sky, high above the mountains. I couldn't help but have the feeling of him watching over us from the heavens. Every adventure has a story, and here is mine. I could start off by saying it was a beautiful fall morning in the mountains. I could start off by talking about the great time I was having away from my family in the pressure cooker of a state we call home. Because I seriously thought I was going to puke or pee my pants or both. The sleepless night didn't help at all. It was horrible! On the way up the canyon from Colorado Springs Tobi asked me, in all seriousness, "Are you doing this just because I wanted to?" Or something like that. I said no, of course. Because it is the truth. 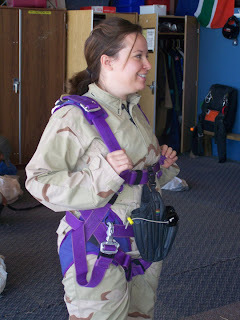 Though I was scared stiff I was so excited to do something totally out of the norm. My greatest fear is falling without being able to control myself. 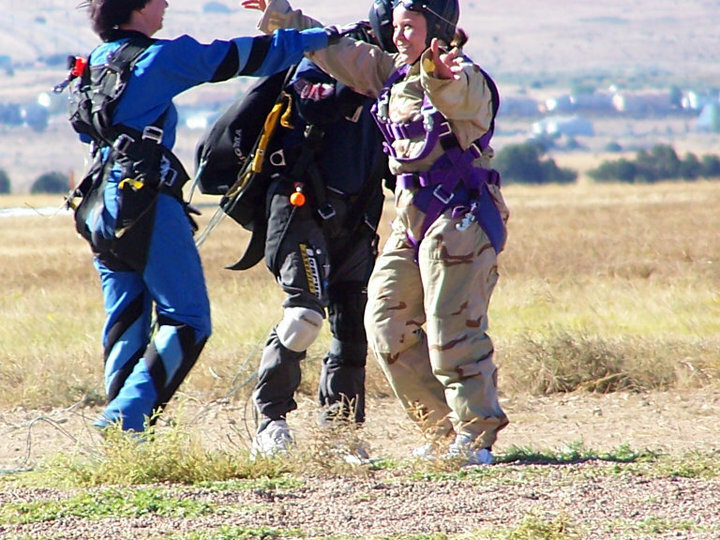 I felt like skydiving was confronting that fear head on. I want to have an exciting life, and I want my kids to look back and say, "look how cool my mom was!" We got there early, so we sat in the car and played around on facebook, dropping hints to all of our friends about what we were getting ready to do. One of the staff came up to the car and asked us if we were there for skydiving. When we said yes he asked if we wanted to go ahead and come in to start filling out the paperwork. What was our answer? A very timid, sure? I think we were trying to put it off as long as possible. The video we had to watch was hilarious! I wish I would have taken a picture of the guy on there that was supposed to be telling us about what we were signing and the madness we were getting ready to partake in. He had a super long beard. 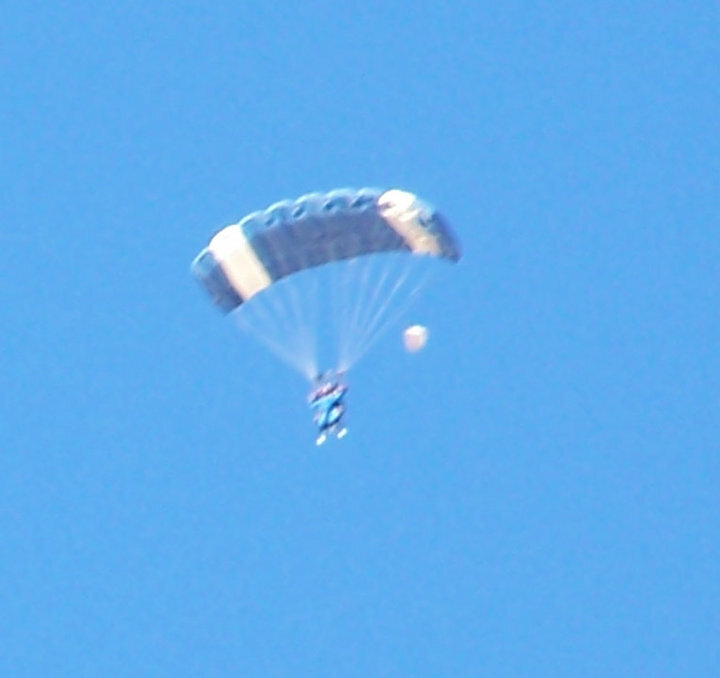 I think Tobi called him and Amish skydiver. I also wish I would have taken the time to get a copy of, or read, what we were signing. 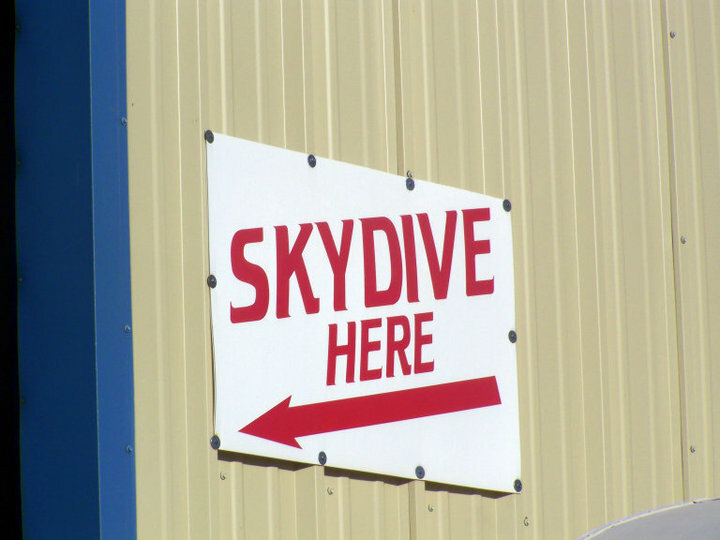 I am sure there was a lot of, "Skydiving is an extreme sport. Skydive the Rockies is not responsible for the loss of life." You know, stuff like that. Then it was time. Time to get all suited up. I will be honest when I say that the "training" went by in a blur. I am not surprised that I remember little of what I was told to do. I was so not ready when we were told to get in the truck so we could head off to the plane. 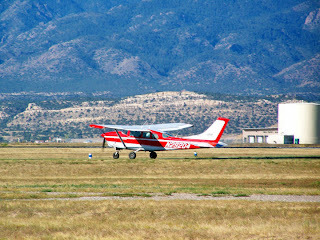 The plane. Let me just tell you about the plane. 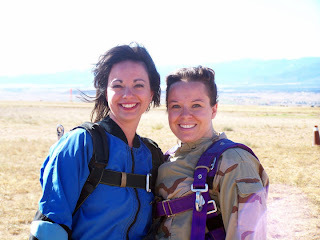 I wouldn't say that we were jumping out of a perfectly good plane. There was duck tape on the walls, the carpet was coming up in places. We were told to not touch the walls when trying to get into the plane. 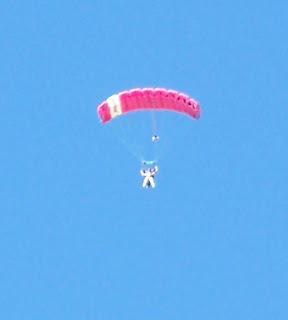 Oh, there was no door, which I know is important when skydiving, still it was strange. Planes are supposed to have doors. I don't know, but I am pretty sure that jumping out seemed more doable than landing in it. That may be the point though. They told us when we were halfway up, but I can tell you now that they were totally lying. I think they just wanted us to feel comforted about the time we had remaining. Before we knew it, it was Tobi's turn to go. It felt like slow motion to me. Watching her move to the doorless door of the plane and disappear into the heavens was like an eternity to me. 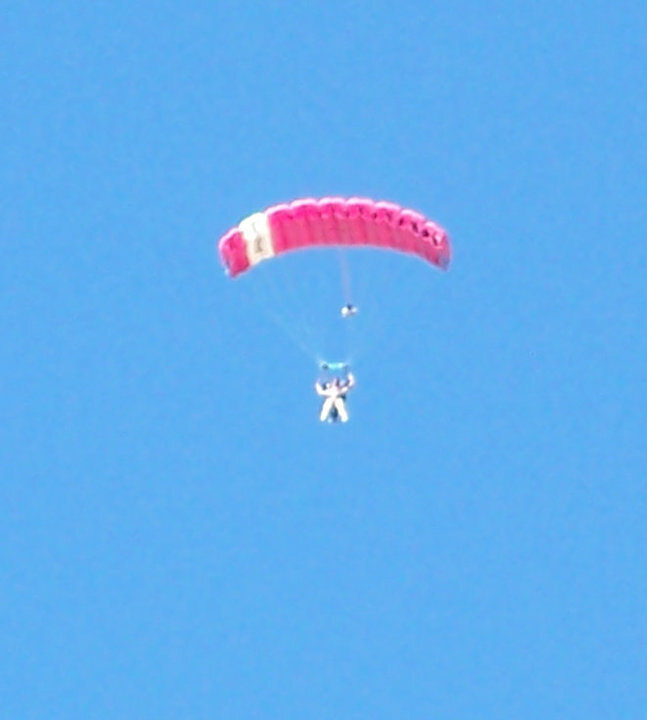 However, watching her be brave enough to swing her legs outside the plane made me feel a little more comfortable. Then it was my turn. It was no eternity, let me tell you. 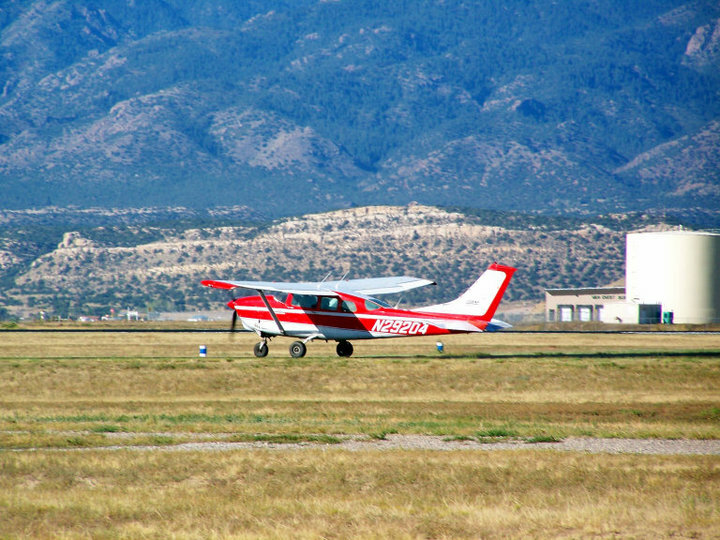 From the time he said, "legs flat and move to the door" and the time I was falling out of the plane seemed like 10 seconds, seriously! 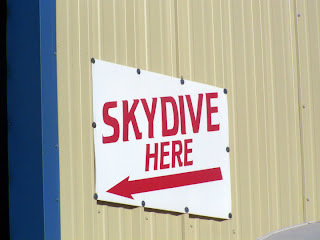 The feeling of free fall is nothing like I thought it would be. Not scary. Not at all! Breathtaking, Awesome, Humbling... these are words that come to mind. 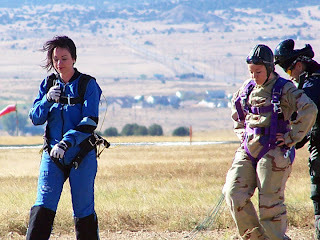 10,000 feet and falling was truly the most amazing thing I have experienced in my life. I think of other events that I consider some of the greatest (which is a whole other blog), the birth of my children being on the top of my list. No more, no way. Skydiving was WAY cooler! This looks way more dramatic than it really was. No matter, I still love this one! I love this picture only because it reminds me of exactly how I felt when we landed. A crazy mix of adrenaline, excitement, wonder, amazement, what was I thinking? !, that was so COOL! So, there you have it. Go out and do something crazy with someone you love. You won't regret it! P.S. Thanks to Mom and Dad for coming out to watch us and take pictures. Pictures were necessary so we could offer up proof!